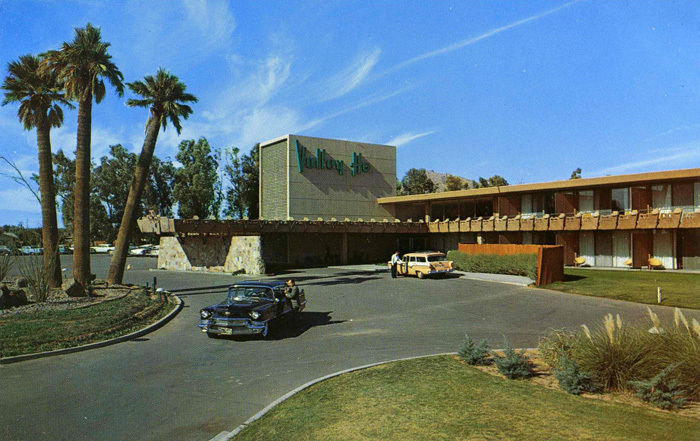 Built in 1956, the Hotel Valley Ho never had time for its original grand opening. The rooms filled up far too quickly to bother. And the full bookings continued as tourists came to participate in Scottsdale’s vibrant arts and culture and industrial giant Motorola moved in and temporarily housed its thousands of employees in the hotel’s graceful poolside rooms. 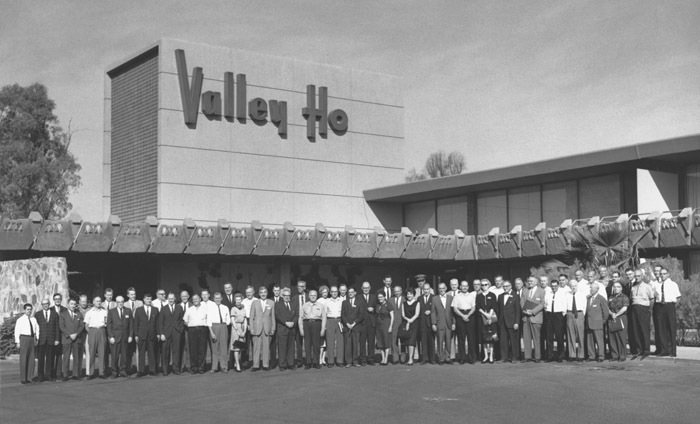 The Valley Ho and its incredible early popularity are reflections of the economic prosperity of 1950s America and the burgeoning cosmopolitanism of early Scottsdale. Businesses were springing up, industry was coming in, the population was rising, and housing was in high demand and short supply. Scottsdale was becoming both a haven for tourists and virgin territory for business expansion. 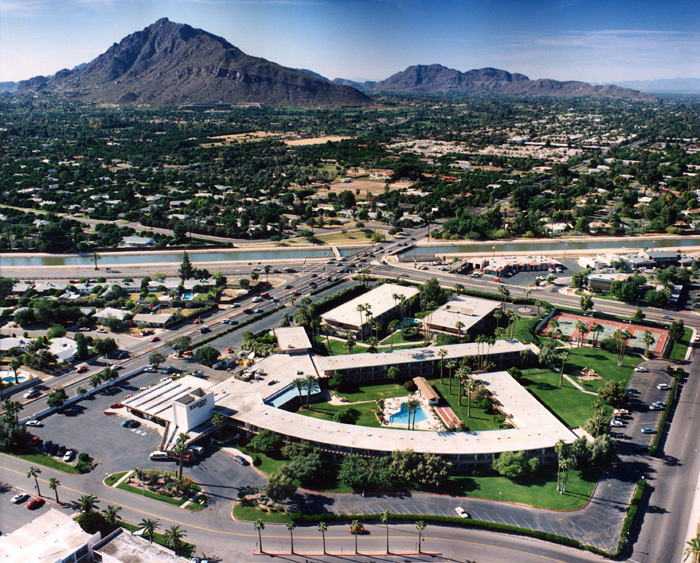 Although the Hotel Valley Ho was the object of an 80 million dollar rehabilitation and it had a grand reopening in 2005, when you look at the main building today, what you see is the same organic architecture that bridged the gap between mid-century modern style and southwestern flare. 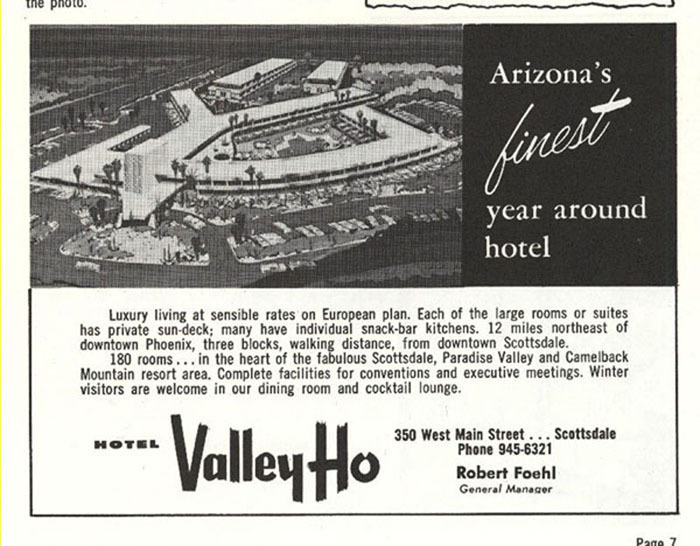 This is evidenced in the very name of the Hotel Valley Ho, which its operators Bob and Evelyn Foehl chose by holding a contest to find a moniker that conveyed the appropriate “westward flavor.” The way the Valley Ho bridged these two worlds rendered it an important sign of 1950s Scottsdale’s development. The postwar economic boom bred a host of luxe accommodations and tourist amenities in Scottsdale, and because travel and recreation, if only for a few weeks a year, were now within reach for many more Americans, Scottsdale quickly lured flocks of vacationers and seasonal residents. 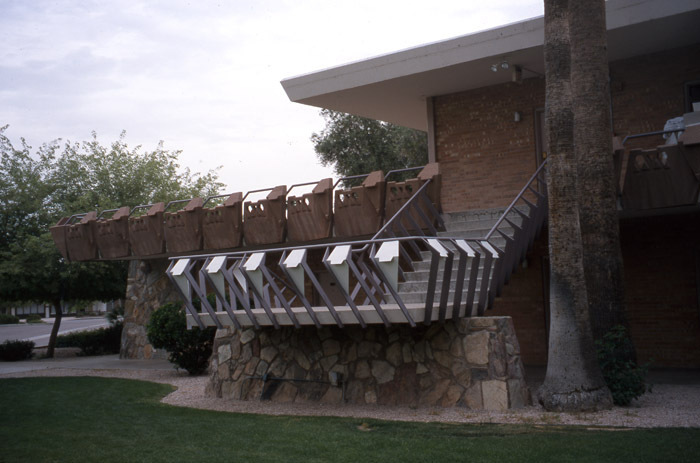 Scottsdale was forging its identity and aimed at glamour and glitz, but differentiated itself by celebrating local southwestern aesthetics and traditions. The Valley Ho conjures up a 1950s Scottsdale in which new industries were coming to the valley bringing promises of more jobs and increasing financial stability and in which tourists, many only newly able to afford vacations, hurried here to lounge by the pool and bask in the sun. The Valley Ho conjures up a Scottsdale of growth, recreation, optimism, and plenty. 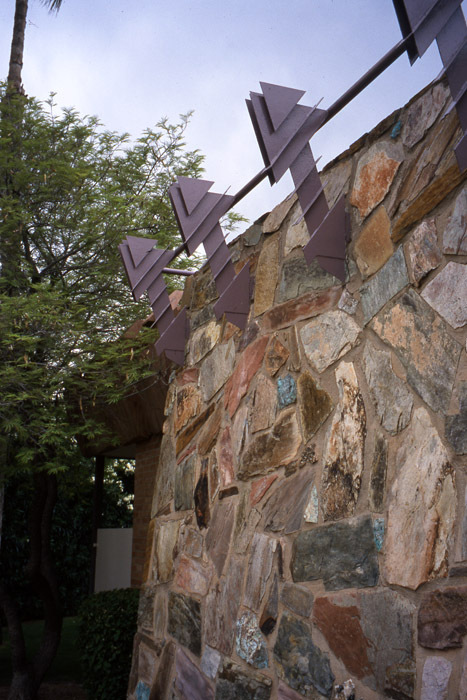 Though this is only one part of Scottsdale’s story, it is a part that Scottsdale has gleefully embraced. A Motor Hotel: The architecture of the Hotel Valley Ho reflected both the optimism of mid-century America, but also the import of automobiles. An early "motel," the Valley Ho featured a drive-up entrance at the intersection of Main Street (later Indian School Road) and 68th Street. Image courtesy of Scottsdale Public Library ~ Source: Scottsdale Public Library. 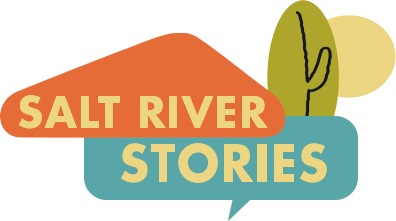 Amy Long and Mark Tebeau, “Hotel Valley Ho,” Salt River Stories, accessed April 22, 2019, https://saltriverstories.org/items/show/32.